The laser used in the laser die board cutting machine is CO2 laser, while the CO2 laser is a gas molecular laser. The working substance is CO2 gas, and the assist gas is nitrogen, helium, and the like. The laser energy conversion efficiency of this laser die board cutting machine is as high as 25%. Therefore, lasers that are often used for high power output are suitable for laser die board cutting machines. The wavelength of carbon dioxide laser is 10.6 um. It is impossible to see infrared light, and the stability is good. It is suitable for laser die cutters，and widely used in the laser die cutting machine industry. Any molecule has three different forms of movement. First, the electron mov ement in the molecule determines the electronic energy state. The second is the atomic vibration in the molecule. The atom makes periodic vibrations around its equilibrium position. This movement determines The vibration energy of the molecule is too strong. Third, the rotation of the molecule determines the rotational energy state of the molecule. The CO2 laser discharge tube is filled with a mixture of CO2, N2, He, etc. The mixing ratio and the total gas pressure can be varied within a certain range. 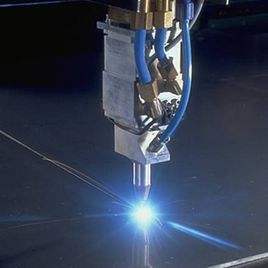 The CO2 laser of the laser die cutting machine utilizes the vibration of the CO2 molecule and the transition between rotation levels to produce lasers.